Located near the start and finish line! 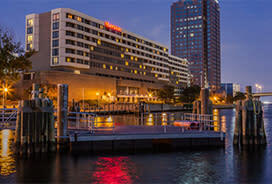 Sheraton Norfolk Waterside Hotel is Norfolk’s only waterfront hotel and provides stunning views of the Elizabeth River. From the hotel, stroll down the waterfront esplanade to Town Point Park, a main hub for festivals and concerts. Enjoy great shopping at MacArthur Center and great dining and nightlife in the evening, as Granby Street and its many upscale bars and night clubs is just a short walk away. 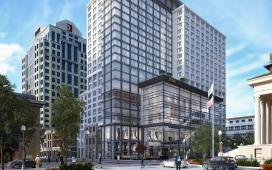 This modern hotel is a 2-minute walk from the Civic Plaza light-rail station and a 3-minute walk from shopping at the Macarthur Center mall. Contemporary rooms offer free WiFi and TVs with premium cable channels, plus desks, minifridges and coffeemakers. Suites and upgraded rooms add separate living areas with pull-out sofas. Book by phone either toll free at 1-800-894.7956 or 757-963-6000. Callers must mention Norfolk Harbor.